When did the Smyth Report become known to the Japanese? 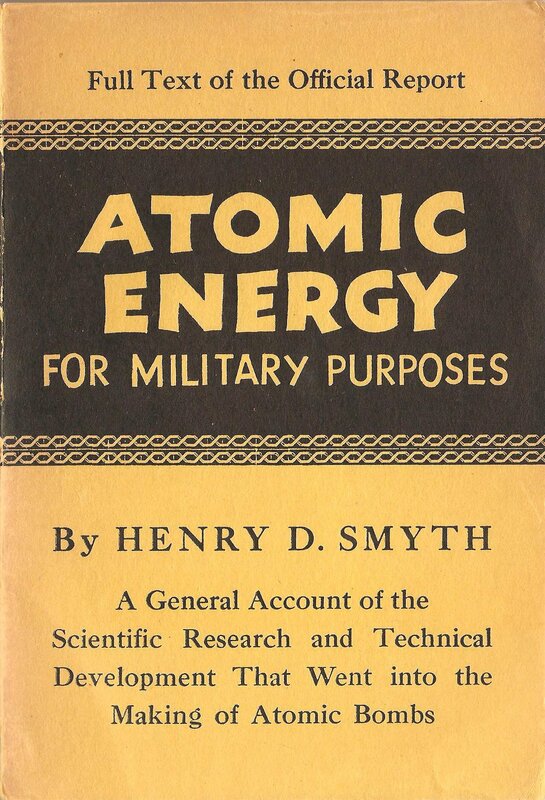 The Smyth Report explained how the Manhattan Project had developed the atomic bomb. As I recall, the report was released to the public a few days after Hiroshima. I also believe the report appeared in a multi-page newspaper article, but I'm not sure in which newspaper it first appeared or when. I'm also not sure who authorized the release of the report to the newspaper. Does NARA have a copy of that newspaper and documents to answer my other questions? I also know that the Japanese learned a lot about the bomb from inspecting Hiroshima and Nagasaki. But if they read that American newspaper, they undoubtedly learned even more. But it all depends when that newspaper article was published. That's why I want the details. Re: When did the Smyth Report become known to the Japanese? A cursory search of our records shows a number of entries related to Mr. Smyth and the report, but few from the actual time period relevant to your question. This catalog search may prove useful to you in locating some of these records from his time spent in federal employ. Most of Smyth's papers are not in NARA's collections, but those of the American Philosophical Society in Philadelphia, Pennsylvania. A file list is located here if you are interested. With regards to secondary sources, this piece from the Department of Energy places the publication date of the report at August 12th and this one lays out the reasoning offered by the pertinent figures at the time for its release. Later (after Japan had surrendered), the Smyth Report was published in book form. The author of the blog "Restricted Data" lays out a convincing case for the tensions between Smyth and Groves leading up to the publication of the report. His claim is that Smyth wanted full disclosure while Groves insisted upon secrecy in certain methodological regards on the production of the bombs. What is well established is that the book was published August 12th. The author's piece is worth a look along with his other material. DOE also has a decent accounting of the locations of the Manhattan Project material itself if you wanted to dig that deep. Most of it is likely not specific to the Smyth Report, but could provide some insight. 1. I seem to recall a multi-page newspaper version of the Smyth Report. According to Wellerstein's piece, there was a book version published on August 12, 1945. If there was a newspaper version, published by the Argonne National Laboratory in the local paper, perhaps, was that on August 12th too, or a few days earlier? 2. Newly discovered documents (at NARA( show that Japan's atomic program didn't end the day Japan surrendered, but actually continued until power was shut to their lab was shut off by the Americans. These documents reveal that Japan advanced further than anyone has previously believed. 3. Other newly discovered documents (at NARA) show when the Americans first interviewed Japan's top scientists. Again, this wasn't on August 15, 1945, when the Emperor agreed to surrender unconditionally. These documents show that Japan only released the documents they chose to release (mostly outdated ones), and they hid equipment from American investigators. 4. Other evidence suggests that the Japanese made some of their greatest advancements after Hiroshima. 5. If the Smyth Report was published on August 12, 1945 or even earlier, it's possible that Japanese spies in the U.S. (of course there were spies here) relayed that new information concerning plutonium, etc. to the Japanese in Japan. All of this will appear in my book in the works. My co-author is an applied nuclear physicist from Stanford who has analyzed and evaluated those newly discovered Japanese nuclear documents. Because the National Archives maintains the permanently valuable records of the Federal government, it is unlikely that the specific newspaper you are searching for would be among our holdings. To locate a particular article, you might try searching a database like ProQuest. Many individual newspapers (e.g. The New York Times or The Washington Post) also offer online access to their archival holdings. You should be able to narrow your search by date to identify the specific article you are looking for. Although the National Archives is unlikely to have the newspaper you are interested in, the information you are searching for may be found in military press releases from 1945. The series Press Releases Related to the Atomic Bomb and Atomic Energy, 1945-1946, for example, from Record Group 428: General Records of the Department of the Navy, 1941-2004 may contain information related to your research. Or the series Press and Radio News Releases, 1921-1947 from RG 165: Records of the War Department General and Special Staffs, 1860-1952 might also be useful. Another potentially helpful series might be Transcripts and Summaries of Press Conferences, Speeches, and Public Statements, 1940-1945 from RG 107: Records of the Office of the Secretary of War, 1791-1948. Best of luck with your ongoing research, and thank you, again, for posting your question to the History Hub. Most don't have access to the New York Times database. I do. When I checked, I found nothing other than an announcement that the Smyth Report was available. I now suspect an an abridged version of the Smyth Report was published in a newspaper of the University of Chicago or perhaps Argonne National Laboratory, not in a national newspaper like the New York Times or Chicago Tribune. Since I don't have access to the Chicago Tribune database, I can't check.